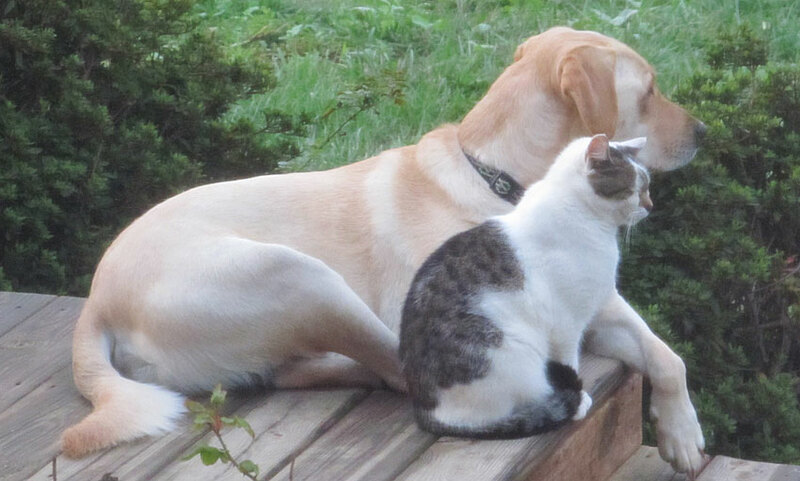 Rudy checks the yard to the west while Skeeter makes sure nothing's sneaking up the steps. Keeping an eye to the south, Rudy is vigilant. Skeeter... not so much. Looks like she's falling asleep. Rudy has spied the mama. Skeeter catches a quick nuzzle. If these photos look a bit familiar, it's because I've posted similar ones previously. This is a very common scene here at our house. 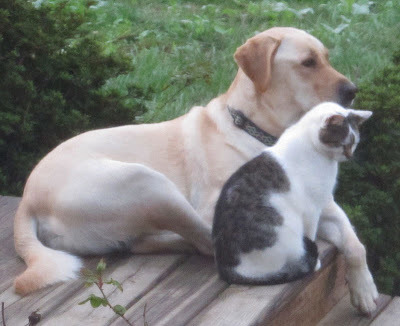 Rudy and Skeeter love to lounge together on the deck. Sometimes there's a bit of grooming, but mostly they just cuddle close and survey their kingdom. Where's Jeffie, you ask? While these photos were being taken, Jeffie was by my side trying to figure out what was going on. Hey Jeffie, Hey Rudy, Hey Skeeter, Jet here. Hi Miss Sue. Awwwww, so cool. Puffy would NEVER nuzzle a "lower life form!" Awwwwe! It looks like Rudy and Skeeter have a special bond. I love the way Skeeter snuggled into Rudy. Adorable!! How sweet is it that! Happy Wednesday! 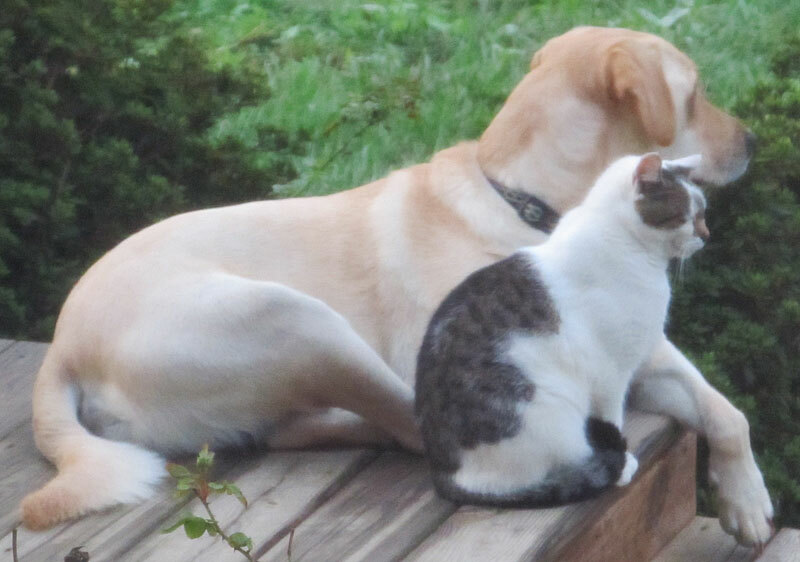 "Rudy has spied the mama." - LOL. Rudy how sweet! I use to cuddle with my cat Miso...Those furry little things are fun! 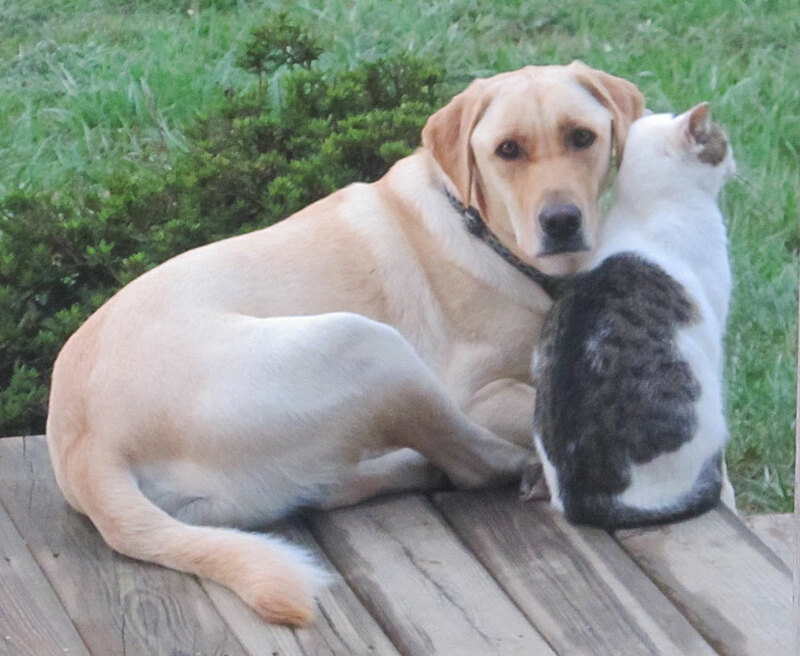 It's so sweet when cats and dogs can live together! Very cute. 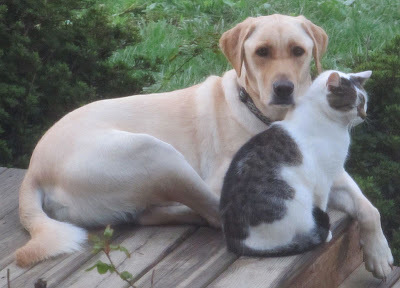 I have a cat pal Jasper but he is not sure if I'm a good pal.